Begin your quest with the enchanted unicorn and ride your way into the magical forest in this beautiful online slot game. Nyx Gaming Group is continually growing its online casino games portfolio with more and more quality content, putting a lot of energy in creating some of the best experiences for players, through fun and easy-to-play games. A lot of their success is due to innovative and unique developments, meant to keep any player entertained and coming back for more. The Unicorn Legend slot game was created for those of you who seek a drop of magic in our everyday life and wouldn’t deny a sparkly unicorn who promised to show you big prizes. Hop on and let the adventure begin! Legend has it that unicorns are magical creatures that bring treasures and wealth to anyone who has the incredible luck to see one. It seems that now you can be one of the lucky ones, in this exciting slot experience that promises not only to engulf you in a world of magic, but also to help you come back to real life a lot richer! Follow the path down this enchanted forest, admire the sparkly purple sky and keep your eyes out for unicorns- they’re behind every corner in this game, waiting to make your wishes come true. 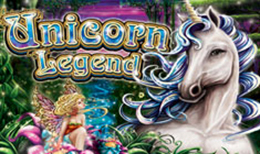 With 5 reels and 25 paylines, Unicorn Legend makes the most out of this mythical theme, so that you’ll be playing in front of a mysterious, relaxing and mesmerizing background, accompanied by charming music. The gorgeous graphics and colourful buttons only make it more attractive. Everything is possible when you’ve got a unicorn by your side. So place your bets, starting from as little as 0.20 credits and going up to 5.0 credits, and adjust the number of paylines you want to be active. It is up to you to make this slot experience magical! You will never get bored in this mystical forest, as Unicorn Legend has plenty of exciting features to keep you thrilled. Spin 5 matching letter or number symbols and you can win 150 times your bet. Those symbols don’t only look enchanting, they actually are! Pay most attention to the magical places and creatures, though, as spinning 5 Enchanted Castles gives you 1000 times your initial stake, and if you’re so lucky to find 5 magical fairies, they’re generous enough to offer you 2000 times your stake. The majestic Unicorn symbol is the Wild in this game. It only appears on reels 2, 3 and 4, and it replaces any other symbol, besides the Scatters, to form winning lines and bring you extra wins. Once you make a unicorn your friend, it’ll look out for you forever! The complex and mysterious Emblem Symbol represents the Scatter in this slot game and spinning 3 or more of them rewards you with up to 200 times your stake! Moreover, through the Free Games Feature, you can choose how many Free Games you want (20, 15 or 10), each with different prizes to win. Unicorn Legend is a beautifully designed slot game with lots of exciting features to look forward to as you join these mythical creatures into a magical forest. Dream Jackpot is a brand managed by White Hat Gaming Limited (Company). The Company is registered in accordance with Maltese law with registration no. C73232 whose registered office is 85 St John Street, Valletta, VLT1165, Malta.